It looks like I’ll be expanding my yearly quota of LOL Tournaments hosted by running one at Anime Central this year. Radical, I know. That means you’ll get the same World9Gaming and Mephisto experience at a new venue… this time in a dedicated LAN Room in the Hyatt Regency O’Hare Hotel. I can’t wait to host it but in the meantime, you’ll need to know the particulars about the event. The sooner you register, the quicker I set it up, and the smoother it runs. It’s a 5v5 Tournament on the Summoner’s Rift. Casuals and “serious” gamers are both welcome to join. I only have one rule (in addition several other rules that I have), don’t be toxic to each other. We’re all here to have fun and slake the lust for competitive LOL play on a local level. AMKE’s LOL Tournament this year was a lot of fun – the most fun I’ve had at a competitive event since a particularly infamous MTG PTQ. Basically, I love running the tournament, meeting new people, casting, and witnessing the triumph of a team eSport. The tournament will run all three days of the convention weekend with the finals taking place on Sunday. The matches will be streamed on Twitch and I’ll personally see to the shout-casting (when I’m not busy setting up matches). 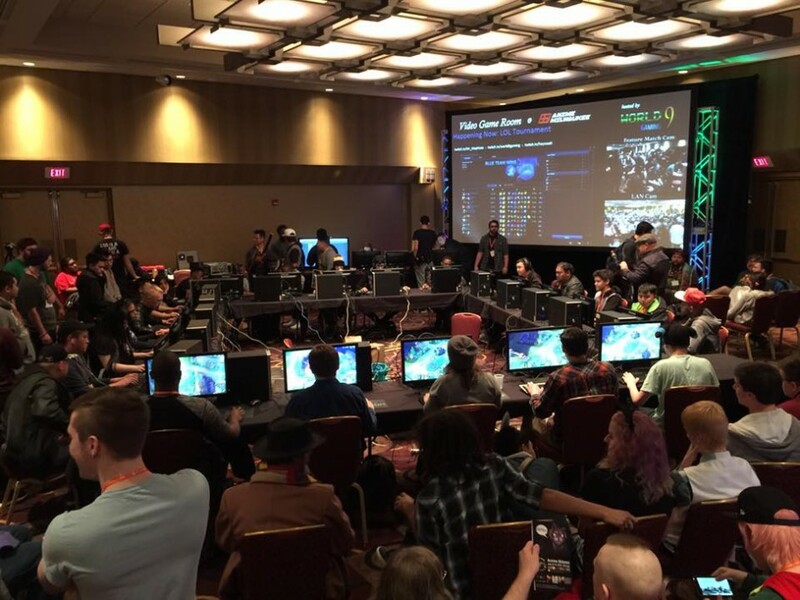 Summary: The ACEN 2016 LOL Championship is an In-Person 5v5 Tournament. Both Premade Teams and PUGs or “Free Agents” are allowed to join. Whether Premade or Free Agent, signups close at 2 p.m. Friday, May. 20. We will be broadcasting the tournament on Twitch and doing some shout-casting when able. Fee: None; this is a free tournament but you do need to have a badge for ACEN. Entrants: ~16 Teams of Five. Each team is allowed one alternate. Players may not sign-up with more than one team. If we have a particularly high volume of Free Agent sign ups we can accommodate additional teams in a “Play-In” Round. Format: Four rounds plus the potential for a play-in round for teams made entirely of Free Agents (aka PUG Teams). The first rounds are single elimination. The semi-finals and finals are a Best of 3. There will be no third or fourth place matches due to time constraints. Tie-breakers (e.g. total wins, strength of opponent) will determine places. The bracket will be randomly seeded using Battlefy. Hardware: World9Gaming will be providing 20 PC/Gaming Machines for the event. You are allowed to bring your own peripherals such as a keyboard, mouse, and headset. We especially encourage you to bring a headset or headphones as we have a limited supply. Tournament Schedule: The tournament begins at 4 p.m. Friday, May 20. The finals match starts at 11 a.m. Sunday, May 22. Match times will be approximated (usually within 45 minutes of each other) with team captains being informed of their upcoming match via social media (potentially text) prior to the previous match’s finish and allotted a 15 minute check-in period. Failure to check-in results in a forfeit. Day 1: Friday. Play-in and Knock-out Round 1. 4 p.m. start. Day 3: Sunday. Finals Bo3. 11 a.m. start. Additional Prizes: We’ll have an additional pool of VGR prizes of an Anime Nature. A pool of prizes from t-shirts to key chains and other swag will be provided by the convention and handed out to the teams out to 4th place. Registration: To register for the tournament please send an email to magicalmistermephisto@gmail.com with the “Subject LOL Tournament Team” (if you are registering a team) or “LOL Tournament Free Agent” (if you’re just registering yourself). Please provide your Team Name (if applicable), the Summoner and First names of all participants along with their roles, and contact information for the Team Captain (twitter, email, text/cell). Since Anime Central is a live convention there will be an in-person signup sheet at the event. Registration for both online and in-person signups closes at 2 p.m. on Friday, May 20. IMPORTANT: Signing up through the LOL Community Events Page for this Tournament DOES NOT sign you up for the tournament. YOU MUST EMAIL ME. Contact: For any additional questions or comments contact me through direct message on Twitter @mr_meph or send an email to magicalmistermephisto@gmail.com. Good luck, Summoners, I look forward to seeing you all at Anime Central. PS: For those curious on how AMKE’s 2016 LOL Tournament played out, you can check the playlist over on YouTube.